we always point out to them that birthdays are not only lavish celebrations with gifts and parties but it's a great day to talk about the positive steps they are making and applying in their progress, what their strengths are and how proud we parents are of them. Birthdays are a must for celebration in our family, we don't let these marvellous milestones pass by without having fun, either we choose to have party or quiet celebration. Recently our daughter had her birthday, she has reached a milestone and clocks up 21 years, it was a huge responsibility on me to organize everything, from buying gifts to baking a cake for the birthday girl, who now falls in the adult category. I thought that I was being swept up in whirlwind as I naturally was concerned about her liking and disliking about gifts and food, since I love shopping and cooking, I cannot complain ! She had quite a few surprise parties from friends and family and every moment she spent with everyone, she loved it. Cakes are the centerpiece of any birthday celebrations in our life that we treasure, and we had perfect occasion which was demanding a cake with a wow factor ! I started to search for special cake recipe with a wow factor, at the same time the question I asked myself is that can I bring that wow factor as I am a novice baker, but family sees and appreciate my efforts, so then the efforts been worthwhile. After searching almost every possible baking site for months, I settled for Chocolate and Caramel ombre cake from here and thought about frosting and decorating the cake, as I wanted something special that she would have loved, with a topping that would just take her breath away, and these were non other than Maltesers, her favourite! I kept checking on the cake and kept my fingers crossed and kept husband on standby if something goes wrong with the cake he has to run and fetch a cake for me. Thankfully the cake turned out fine, frosting set perfectly and held almost 500gms maltesers tightly, of course my beautiful cake topper was in a place where it should be which was highlight of the cake. There was a plenty of ooh's and aah's when finally cake came out on a table. We all did postpone our January healthy eating plans and had a dose of decadent , rich and moreish cake and plenty of sinful delicacies over the weekend. Cake went pretty quick after the birthday girl did the honour there was only one slice left and few crumbs, not whining that I couldn't take shots of the cake slice but actually overwhelmed that cake vanished so fast and everyone enjoyed every bite of it. A gilded Chocolate and Caramel Maltesers ombre cake was a ultimate indulgence and one of the highlights of our celebration, a taste not to forget in a hurry and it was perfect match for our theme and occasion as a golden era has begun in daughters life from now on ! 1 packet of gold wires 22 gauge about 6" long. Pre heat oven to gas mark 4. Grease and line bases of the two 20cm cake tins with baking paper. For the vanilla and chocolate sponge combine all the ingredients except the cocoa and mix or blend to give a smooth texture. Divide half of the mixture in another bowl and whizz in the 5 tbsp. cocoa. Pour in the lined cake tin and bake for 30-32 minutes or until skewer inserted in comes out clean. While four of the sponges are cooling, make frosting. Melt the both chocolate together in a bowl over a pan of barely simmering water. When the sponges are cool, place vanilla sponge on a serving plate or cake stand ( it's a good idea to put a dollop of frosting underneath the sponge so that the cake doesn't move around. Spread a third of caramel over the vanilla sponge. Now top with the caramel sponge and again spread a third of caramel over the caramel sponge. Now top with the caramel chocolate sponge, spread remaining caramel and top with the chocolate sponge. Now spread the chocolate frosting over the whole cake. 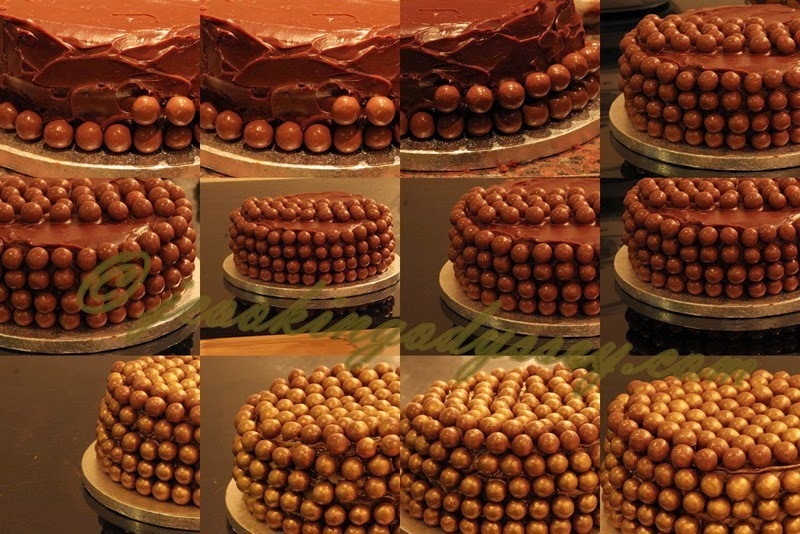 Once cake is covered with the chocolate frosting, take the maltesers and stick them all over the cake. Try and stick them in a nice line without any gaps..but if not who cares !! Allow the maltesers to stick properly. Now spray the gold spray and let it set for a while. Start rolling out a fondant pretty thin, if fondant sticks to the surface use corn starch. Then paint or apply very little glue on the one side of the stars. Then lay a wire in the centre of the star. Let it dry overnight and when ready put several wires together and slide them into straw. Then bend them to spread out. Insert the straw into the cake. I made few fondant balls and sprayed them with the gold spray to make gold maltesers. such a beautiful cake. Belated 21st birthday wishes to your daughter. Jag this cake looks amazing I am sure Hayley must have loved it.